Carbide tipped saw blades are sharpened on the finest grinding machines utilizing ultra fine diamond grit wheels. Blades are inspected, flattened if needed, polished, broken or missing tips are replaced, sharpened and dipped in wax to protect the teeth. Accuracy and extremely tight grinding tolerances ensure that your blade cuts like a new blade or even better than new. Minimal carbide removal allows for some blades to be sharpened as many as fifteen to twenty times before the blade needs replaced. 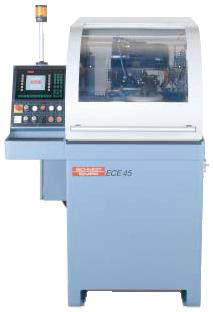 Cold saw blades are sharpened on German manufactured CNC sharpeners which ensure that each blade is sharpened to extremely tight tolerances to a super fine finish. 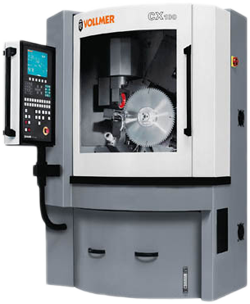 CBN grinding wheels produce the consistent tooth shape and finish that is needed to acheive maximum cutting life between sharpenings. Poorly sharpened blades will act dull prematurely while properly ground cold saw blades will cut like a new blade again. Steel saw blades are sharpened on the same CNC grinders as cold saw blades. Quality and consistency is what you can expect. Minimal steel removal allows for some blades to be sharpened as many as twenty times before needing to replace the blade. Circular knives are joined and sharpened to a honed finish. We sharpen Router Bits, Planer and Jointer Knives, Chipper Blades, Shear Knives, Straight Knives etc. Just a few of the machines we use to sharpen your blades. Want us to sharpen your blades? Click our Sharpening Order Form to start the process!